You might think of soup as more of a winter item. 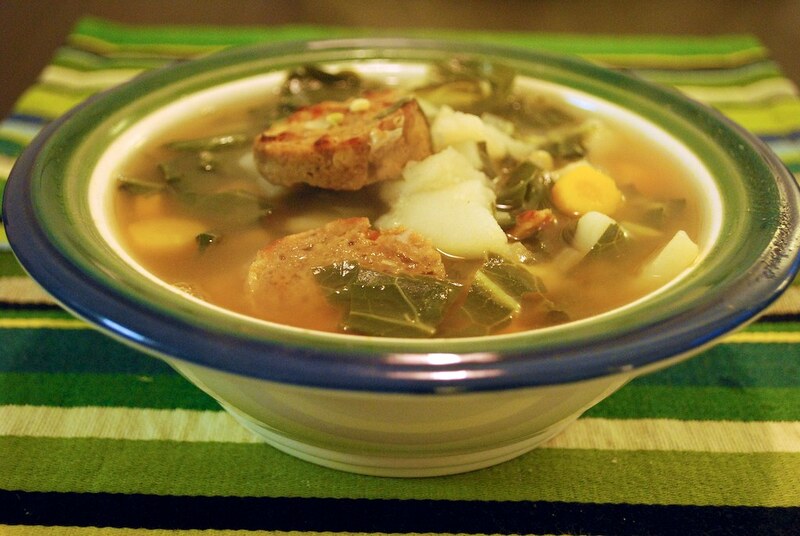 It’s true: the cold can make anyone crave a steaming, tonic bowl of soup. But summer can be perfect for soup too, if you give it a chance. Warmer weather leaves me wanting lighter meals, and the bounty of the summer harvest makes for a richly flavorful melange. A good rainstorm, as we are predicted to have every other day for the next week, will make the soup even more enticing: comforting, homey. So give it a try and see what you think. After all, in Southern India, probably the hottest place I have ever travelled, they think nothing of starting each morning with a steaming bowl of soup. They must be onto something. 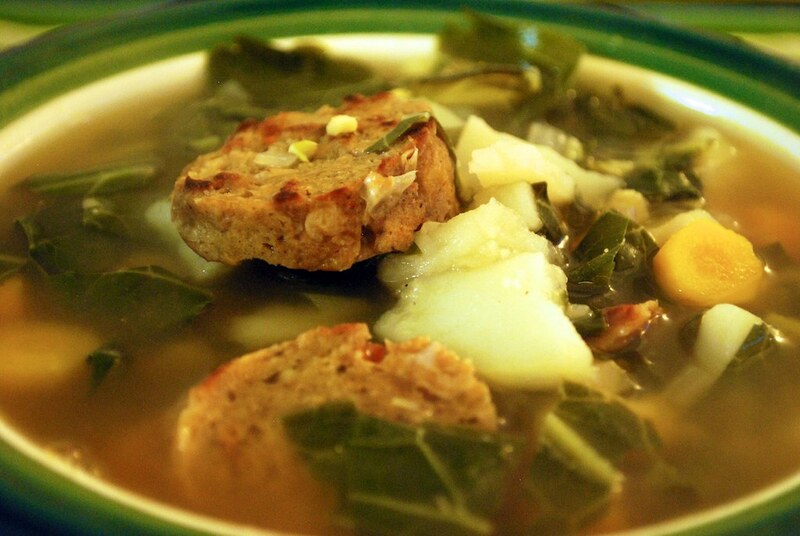 This a vegan adaptation of a traditional Portugese dish called Caldo Verde. I was inspired to try it after Portugese kale (pictured above, top left) arrived in my farm share. Sure, I could cook it any number of the ways I already know and love to cook kale, but why not use the excuse to learn something about Portugese cuisine? The soup is a fabulous one-pot meal. The potatoes, kale, carrots, and onion make a richly flavored base. Pan fried vegan linguica sausage has a tangy, smoky flavor from the combination of red wine vinegar and smoked paprika. Spice it up with some red pepper flakes. And the addition of fresh fava beans is the icing on the cake. Try it with kidney beans though, if you don’t have favas; kidney beans are actually a more traditional choice. 1. Prepare steamer: put steaming basket into pot and bring water to a boil. 2. Add beans to mixing bowl, and mash them with a pastry cutter or knives. Add the rest of the ingredients, and mix well with a fork. 3. Divide the dough into four equal sections, and mold each section into a 5-inch log. Place the dough into a sheet of tinfoil, and wrap the foil around the log of dough like a tootsie roll. Repeat with other three mounds of dough. 4. Steam the wrapped sausages in covered pot for 40 minutes. 1. 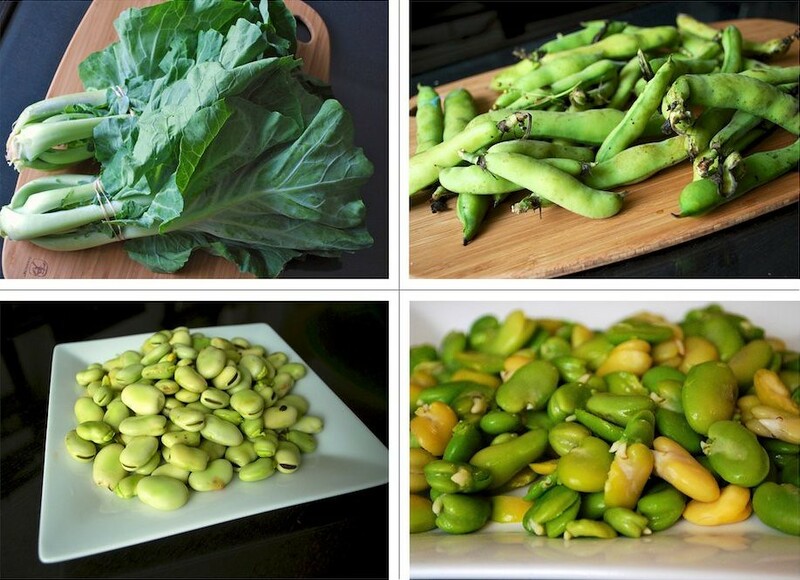 Prepare the fava beans: Set a pot of water to boil, as you shell the beans from their large outer pods. Blanch shelled beans for 1 minute in boiling water. Drain and rinse with cold water. Remove tough outer casing around each bean (pinch the bean to release it from its casing). Set the shelled beans aside. 2. In a large stock pot, heat olive oil. Fry sliced linguica until it is golden and crisp. Remove the sausage from the pan and set aside. 3. Return the pot to medium heat, and add the onions and carrots. Cook until softened, about 5 minutes. Add garlic and red pepper, cook 1 minute. 4. Add broth, potatoes, and fava beans. Cover the pot. Bring to a boil, then reduce heat to medium. Cook about 7 minutes until potatoes are softened at the edges. 5. Reduce heat to medium-low. Add the kale. Simmer for about 5 minutes, until the kale is tender. 6. Add sliced sausages and red wine vinegar. Adjust vinegar, salt, and pepper to taste. Serve hot, drizzled with additional extra virgin olive oil, if desired. NOTE: You may substitute 1 can of drained, rinsed kidney beans for the fava beans if desired. This entry was posted in entree, soup and tagged fava beans, food, kale, portugese, potato, recipe, sausage, vegan. Bookmark the permalink. This looks delicious. I have actually had this before and really enjoyed it. I like your recipe for the sausages. I made this last night, and it was possibly the best soup I’ve ever had. Definitely the best soup I’ve made. Sindha (aka “the cupcake girl”) agrees. I substituted kidney beans for the fava beans, though I can’t wait to try it again with favas. I also used kidney beans in the vegan linguica, and that worked fine, too. YUM! I just made the sausages, and although the flavor was great, the texture before steaming was kinda different from all the other seitan sausages I’ve been making. Is that intended? It was almost creamy as opposed to doughy. I added a bit of bean flour to make it shape-able, and steaming it a bit longer than 40 mins, just wondering if I did something wrong? These sausages do indeed have a bit moister batter than the traditional baked or boiled seitan recipes. I find that after 40 minutes of steaming, they firm up to a sliceable consistency. If you want them to be even firmer, chill them in the refrigerator overnight before you use them. I was also nervous the first time I made them that they would be too wet, but once they steam up, I haven’t had any trouble. your efforts and I am waiting for your frther write upps thanks once again. Useful information. Lucky me I found your site unintentionally, and I am surprised why this twist of fate did not happened in advance! I was wondering if you ever considered changing the page layput of your blog? got an awful llot of text for only having 1 or 2 images. life to listen news on TV, thus I just use the web for that reason, and take the most recent news. Por otra parte, ahora, lo tiene todavía más dócil. Puede apostar desde casa puede hacerlo también desde su móvil. quick. I’m thinkking about setting up my oown but I’m not sure where to begin. Do you have any points or suggestions? A dog pen will give your puppy more space to play while limiting the area in which he can make a mess. or in extraordinary instances, as much as $500. character has to wander around in are so ridiculously huge that you could literally get lost, they are all dark and gloomy too. the closest constructing or weapon.